We’d love your help. Let us know what’s wrong with this preview of Ladies Who Punch by Ramin Setoodeh. Based on stunning interviews with nearly every host and unprecedented access, award-winning journalist Ramin Setoodeh takes you backstage where the stars really spoke their minds. Here's the full story of how Star, then Rosie, then Whoopi tried to take over the show, while Barbara struggled to maintain control of it all, a modern-day Lear with her media-savvy daughters. You'll read about how so many co-hosts had a tough time fitting in, suffered humiliations at the table, then pushed themselves away, feeling betrayed—one nearly quitting during a commercial. Meanwhile, the director was being driven insane, especially by Rosie. To ask other readers questions about Ladies Who Punch, please sign up. Very interesting read about the behind the senses of the show The View. It was fun going to YouTube and reviewing the footage of thing that were discussed. Perfect. Absolute bliss. Wish it were twice as long. I wonder if Barbara Walters and longtime sidekick Bill Geddie sought out the opinion of a personality psychologist prior to presenting the world with Barbara's dream baby, The View. "I've always wanted to do a show with women of different generations, backgrounds, and views; and in a perfect world, I'd get to join the group whenever I wanted"
I'm convinced that on some level, the many implications associated with her dream show and the unintended consequences were not only predictable, but exa I wonder if Barbara Walters and longtime sidekick Bill Geddie sought out the opinion of a personality psychologist prior to presenting the world with Barbara's dream baby, The View. I'm convinced that on some level, the many implications associated with her dream show and the unintended consequences were not only predictable, but exactly the kind of very close to the edge entertainment Walters wholeheartedly wished for when she wrapped up her opening remarks with the ominous caveat, "be careful what you wish for." A little piece of inner-voice verbal monologue? or a curse cackled by the aging mother hen? Either side you align with, some strong arguments for both strategies follow in Ladies Who Punch. Setoodeh's hot new tell-all is [no big surprises] a salacious piece of schmagg that appeals to the catty inclinations most of us deny having. Pure Schadenfreud-y fun. Just the kind of petty nastiness that whets our appetites and allows us to wickedly pick at the cadre of icons and lesser-known beautiful rich people that buy their kids' way into colleges, escape legal justice, or host a powerful daytime TV series. Pre-release marketing front-end loaded the heck out of this, ensuring the book would be snapped up by dangling juicy morsels before the public, like the sound bites of Elizabeth Hasselbeck's blitzkrieg of F-bombs, ranted while the co-host walked off the set after being chastised on-air by Queen Babs. "She has me swearing and I don't even swear!!" Huffs the unsuspecting Hasselbeck, still wired for sound and shredding her cue cards. Of course afterward, the beneficent Barbara hugs her tightly, smiling even tighter. A fine act of compassion and concern worthy of an Oscar after the frequent explosive commercial breaks that provided gloves-off combat on the set for those few minutes. 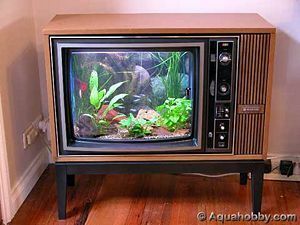 I keep thinking of betta fish. The author/journalist deserves credit. Setoodeh dishes with attention to objectivity, sharing details and observations free of judgments. He is direct; he doesn't analyze nor does he shy away from the insider stories he shares. Star Jones' wedding fiasco - where greed went rampant, the EGOT Goldberg - who showed a not so humorous side when she came to the defense of Bill Cosby to the very end, Rosie O'Donnell's struggles with depression and later with Trump, and Barbara and Bill as co-creators and executive producers, or Judge and Executioner. Barbara Streisand demands to be filmed from a certain side; Faye Dunaway wants naps and exercise equipment; Star demanded no eye contact from employees. Just the facts as told by 5 "very different ladies with very different views." As one would expect, as any therapist would have warned, there were casualties: feelings are hurt, offended, ignored, rebuffed, cut-off, snarled and growled at both on air and behind the scenes. After the string of ever-changing co-hosts came and went it was undeniable that there was an undercurrent of a dream turned nightmare. The View seemed less than fun day as heads rolled. Still today, the atmosphere seems tense, the show balancing precariously, trying to find the right combination of personalities capable of CIVIL discourse and holding onto the ratings. Eventually, the King kills the kingdom or the kingdom kills the King, they say. Maybe Walters should have heeded her own warning, or maybe watched a tank full of Betta fish. Rich women taking themselves and their lives far far too seriously as they contribute to the decline of American discourse. A delicious and savory read! It’s everything I thought backstage at The View to be...and more! The backbiting, the betrayals, the b**** slapping; well, no confirmation of the latter but the book certainly lives up to its title. I’ve never been a regular watcher of The View but loved every word of Ladies Who Punch!! This book is an incredibly entertaining, well researched, thorough, and juicy one. "Ladies Who Punch" boasts an impressive amount of research and original interview content as it documents one of the most iconic talk shows of all time. Unfortunately, the author comes off a bit like Bravo's insufferable Andy Cohen in certain sections. I have no interest in hearing a man describe commentary by the smart and successful women of The View as "bitchy." Being gay doesn't excuse misogyny. This shoudn't need to be explained in 2019. 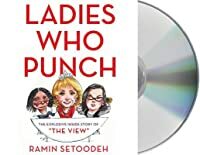 That said, the good outweighs the bad here as Ramin Se "Ladies Who Punch" boasts an impressive amount of research and original interview content as it documents one of the most iconic talk shows of all time. I loved this dishy look at The View...which is funny because I've probably watched the show like 3 times, and all way back when my teens were newborns. There were people mentioned in this I had no idea were hosts! Regardless, I spend a lot of time in the car and listening to this on audiobook made the time pass quickly. The author interviewed most of the players, so it leant a great deal of credibility to the story. Super fun, even for people like me who aren't fans. *chef's kiss* I could have read a book twice as long about all the backstage drama. I love this show, love all these ladies, love this mess. I loaded this to my kindle as soon as it was out and couldn't put it down. I've watched The View off and on since the very first episode. This book was so dishy, I loved it. Also well written and researched. Just a wonderful read. 'Ladies Who Punch' by Ramin Setoodeh is an exemplary view of The View and forms a picture of the rise of women, and the female perspective, in modern Journalism. Setoodeh effectively dissects The View; its ups, its downs, its controversies, and its massive success--in a way that keeps the reader engaged and hungry for more. He outlines how many of the viewpoints of the co-stars throughout the seasons are incredibly relevant today. 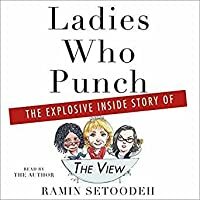 The View, and the diverse opinionated co-hosts, are especially rel 'Ladies Who Punch' by Ramin Setoodeh is an exemplary view of The View and forms a picture of the rise of women, and the female perspective, in modern Journalism. Setoodeh effectively dissects The View; its ups, its downs, its controversies, and its massive success--in a way that keeps the reader engaged and hungry for more. He outlines how many of the viewpoints of the co-stars throughout the seasons are incredibly relevant today. The View, and the diverse opinionated co-hosts, are especially relevant in this current political age in which the media and journalism play a huge role in defining the values of its consumers. Oh I do love a good industry behind-the-scenes tell all! Also, kinda-spoiler-but-not-really: Rosie sounds like a nightmare colleague. The time has finally come for me to come out of the closet: I like watching the View. It's not that I think the women of the View are particularly well suited to political commentary, but rather that I am intrigued by their relationships, the discussion, and (unsurprisingly, given that I decided to read this book) the drama. This book delivered on the drama, and I loved every second of it. Although I haven't been watching the show since the beginning (it was a little before my time), I enjoyed re The time has finally come for me to come out of the closet: I like watching the View. It's not that I think the women of the View are particularly well suited to political commentary, but rather that I am intrigued by their relationships, the discussion, and (unsurprisingly, given that I decided to read this book) the drama. This book delivered on the drama, and I loved every second of it. Although I haven't been watching the show since the beginning (it was a little before my time), I enjoyed reading about all of the decisions, all of the fights, and all of the conniving that went into making such an iconic show. The author was personable and engaging, and I loved his voice throughout. I learned so much juicy gossip about some of TV's most recognizable women, and I had such a fun time doing it. Trash-tastic in a behind the scenes “view” of the television series that Walters started. More impressive was that the author actually was able to speak to most of the women about their positive and negative experience being on the show. I started watching The View from the very first episode and watched for years. When I found out about this book, I knew I wanted to read it. It is very well written and gives good insight into the behind the scene shenanigans and drama. The book does not feel gossipy at all. It was a very easy read. For all the hype of a tell-all, this book falls short of it's goal. I was never a view watcher - every time it went by as I was channel surfing all I saw was arguing and posturing, ranting and raving, and posing and self-inflating. The book reaffirmed the glimpses I saw as the show blipped past on the dial. Self-important people stroking their egos while demonstrating their sense of entitlement. I don't get it. I never got it. Just like I didn't get the impossible-to-remember-even-if-you For all the hype of a tell-all, this book falls short of it's goal. I don't get it. I never got it. Just like I didn't get the impossible-to-remember-even-if-you-were-there list of TV executives that were involved in the show. Who cares? Their names were read and forgotten as soon as the page was turned. I love a good, juicy behind the scenes tell all . This doesn’t disappoint . I didn’t want it to end! Well-written and researched. Enjoyed reading this as a longtime fan of the View. Why did they ever let Rosie come back a second time???? I read this in under 24 hours. It was hilarious and fantastic. A must read if you've ever watched The View! I've never watched a full episode of The View, but I know about it for the same reasons as any other casual TV viewer: Because I know of Barbara Walters--much like non-wrestling fans recognize the names Hulk Hogan and Dwayne "The Rock" Johnson--and because The View made headlines. It has been at the center of too many pop-culture zeitgeists to count, although author Ramin Setoodeh makes a great effort in his first book, LADIES WHO PUNCH. PUNCH is a narrative-style account of the history of The Vi I've never watched a full episode of The View, but I know about it for the same reasons as any other casual TV viewer: Because I know of Barbara Walters--much like non-wrestling fans recognize the names Hulk Hogan and Dwayne "The Rock" Johnson--and because The View made headlines. It has been at the center of too many pop-culture zeitgeists to count, although author Ramin Setoodeh makes a great effort in his first book, LADIES WHO PUNCH. 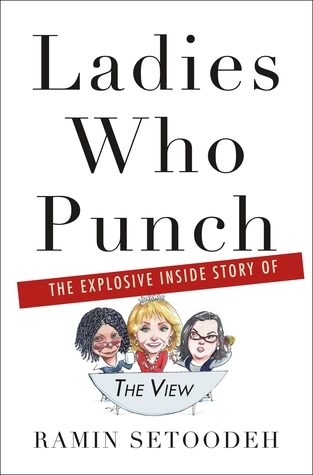 PUNCH is a narrative-style account of the history of The View and its most popular cohosts and moments. The idea was that Barbara Walters was looking for a part-time project when she had downtime from her "real" journalism gigs like 20/20 and anchoring on news programs. Today, Walters is more well-known as the co-creator of The View as for anything else. And with good reason. Never paying much attention to talk shows, teenage me dismissed The View as a table of women yakking about current affairs and gabbing with celebrities. In the years since it premiered in 1997, I've learned that The View was and is so much more. Setoodeh shows the many ways in which The View has become a cultural touchstone and the impacts it's had: on women in journalism and political discussions; on shaping talk shows and TV broadcasting alongside other icons such as Oprah Winfrey and Rosie O'Donnell; and so much more. Of course, The View has made headlines for as many wrong reasons as for the right ones. What started as something for Walters to do in her spare time became a prized jewel in television. Naturally, that led to egos and explosive battles both on-air and backstage. A large part of View's appeal has been the gossip around the relationships between cohosts like O'Donnell and Elisabeth Hasselbeck, Walters and Whoopi Goldberg, and Star Jones and pretty much everybody she worked with during the 12+ months the show revolved around her upcoming wedding. After most chapters, I'd switch from my Kindle app to YouTube to watch some of the famous battles and interviews the author recounted in detail. PUNCH is as engaging in a "I shouldn't be watching this but I can't look away" as it is edifying. Despite all the fluff surrounding The View, it and its cast and crew were pioneers. My only complaint was that Setoodeh did a much better job documenting the first 10-12 years than he did the show's more recent incarnations. He captures the turbulence the show experienced--and continues to suffer from, I believe--since Walters retired in 2014, but doesn't paint as vivid a picture of more recent cohosts such as Raven Symone as he did Walters, Meredith Vieira, Hasselbeck, O'Donnell, Joy Behar, Sherri Shepherd, and Goldberg. To be fair, those are the cohosts who most fans know because they stuck around long enough, and/or were sensational enough, to become part of the show's backbone, so I can't fault the author for digging deeper into the show's early and middle years. Those are the years I wanted to know about, too, and PUNCH more than delivered. It's a must-read for anyone interested in the moving and shaking that goes on behind the scenes of pretty much every TV production ever, I would wager, as well as anyone curious to know more about why and how The View left its mark on our culture. This is a hoot! I want a 'part 2' already. Solid interviewing and very well put together. I've watched The View on-and-off and even if one isn't familiar with the cast, it's a compelling behind-the-scenes look at a talk show from uncertain beginnings and how each person made it on to the show and more often than not, why they got fired. (view spoiler)[17 past hosts, and only Rosie claims to have quit; the others "moved on the other projects" as ABC would say after firing them, often not kindly. This is a hoot! I want a 'part 2' already. Solid interviewing and very well put together. I've watched The View on-and-off and even if one isn't familiar with the cast, it's a compelling behind-the-scenes look at a talk show from uncertain beginnings and how each person made it on to the show and more often than not, why they got fired. (view spoiler)[17 past hosts, and only Rosie claims to have quit; the others "moved on the other projects" as ABC would say after firing them, often not kindly. Although, I think Meredith Vieira quit also. She got 'Today' (hide spoiler)] Mostly a brutal environment between the ABC management and the clashing of the on-air personalities. Also some facts about the surrounding 'talk" scene (Today, GMA, Katie) at the time and gives a little bit if dirt on them. This book could've been 200 more pages and I'd be happy reading it. - Barbara Walters gets upset about see a floating tampon in a toilet and makes Jenny McCarthy "Do something about it!" “Take a little time to enjoy the.”.....beach, trip, meal, anything but THIS BOOK!!! I thought it would shed some light on the cohosts over the years, some inside “dirt”, some funny anecdotes, etc; the entire book chronicled the hiring and firing of these “STARS”, and I use the term loosely, at best. The women who were in fact the real stars, acted like spoiled brats, throwing shade on their cohosts, and tantrums on their bosses. The only person who came off with her reputation in tact, in my opini “Take a little time to enjoy the.”.....beach, trip, meal, anything but THIS BOOK!!! The only person who came off with her reputation in tact, in my opinion , was Meredith. Rosie was a lunatic, Whoopi was mean, and Joy needs to have the last word, ALL the time. Rosie complained she never got to finish a sentence, Elisabeth would be coached privately by Bill Gedde, and then cry on stage when corrected for something she said, and Star tried to milk the network for her entire wedding and honeymoon. Barbara plugged every move she made, yet was so afraid to retire, because she would then be out of the public eye. As someone that has been a consistent viewer of The View for most of my life and as someone that has been in the live audience twice -once during that election night special that ruined Joy Behar's life- I can say that I was hesitant to read this book. I read excerpts before buying; Jenny McCarthy discussing Barbara Walters' declining health didn't sit right with me, as many of her health issues were kept secret until now. After learning that the book was written with Barbara's blessing, I purch As someone that has been a consistent viewer of The View for most of my life and as someone that has been in the live audience twice -once during that election night special that ruined Joy Behar's life- I can say that I was hesitant to read this book. I read excerpts before buying; Jenny McCarthy discussing Barbara Walters' declining health didn't sit right with me, as many of her health issues were kept secret until now. After learning that the book was written with Barbara's blessing, I purchased it. The book is explosive from the very first page and it doesn't stop. If you are someone that has watched and enjoys the show or someone that wants juicy insights into the inner workings of a hit television show, this book is for you. It is no secret that the exit of Star Jones was one of the most dramatic moments in the history of the show, but none of that prepared me for reading about it. Rosie vs. Elisabeth is in books as one of the most WTF moments in television, but that fight didn't prepare me to read about the Rosie years. I read the book in 2.5 days, which for me is quick due to my busy schedule. It was THAT good.